← So You Bought a Yixing Teapot — Now What? We at JAS-eTea know that handmade gives a real tea advantage. Tea processing was all done by hand until machines came along. Now, handmade tea, where traditional methods are used, is becoming a rarity, carried by tea vendors like us who care about quality. We know the handmade tea advantage. In the advent of tea bags, machine processing became more common so that the tea leaves could be ground down to a consistent size and shape for easier bagging (and often faster and stronger steeping). Along the way, the centuries old methods of processing tea leaves by hand became almost a lost art. Vendors dedicated to seeking out and presenting these teas to their customers have helped the growers/processors keep and even expand their audience of dedicated tea lovers. We are dedicated to this approach as well. One big advantage to hand processing is the connection to the tea leaf of the person doing that processing. Changes in texture and aroma can be detected and will determine when the processing is changed or considered complete. So the real key to handmade tea is well-trained tea workers. But then that’s the key to a lot of quality items, not just fine teas! Experienced workers harvesting, grading, and sorting by hand assures that you have the best quality. Would you know a tea leaf that is well formed and at the right stage of ripeness? These workers usually do. This is especially important in teas like pu-erh, where there are 10 grades, ranging from just leaves to all buds (considered the best). Tea such as Silver Tip is comprised of only the tip-most leaves and buds selected by knowledgeable sorters. Yellow teas, harvested before most green teas are, need to be the younger leaves that are smaller and still rolled into buds and, most importantly, whole, not broken. That means careful handling by hand, not machine. These are but a few examples showing the importance of doing by hand these steps in the process of getting tea from the bush to your table. On to the rest of the processing. This steps removes enough of the moisture from the tea leaves so that they are limp and can be rolled and shaped. By hand this is done by simply laying the tea leaves out on racks and letting them air dry. Spreading the leaves out by hand can assure a more even layering which in turn assures a more even withering. Experienced workers check the leaves to assure the right level of moisture is removed. This step releases oils out of the leaves to bring out flavor. Leaves rolled by hand result in a higher quality (and, of course, a more expensive grade) of tea. Again, control over the process is best when done by hand by experienced workers. The person doing the rolling can smell the oils being released and therefore know when to stop. At this stage in the tea processing, skilled tea workers have come to a fork in the processing road. Which direction they go depends on what tea type they are making. For white and green tea they skip this step and go to the next one. 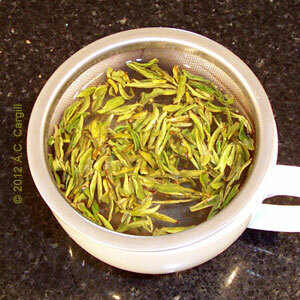 For yellow tea, a slight amount of oxidation is done. For oolong, they oxidize partially, varying from only a little oxidation to a lot. For black tea, the leaves are fully oxidized. The leaves are spread out in a cool room, and the tea leaves start to take in oxygen, which reacts with their chemistry to turn them dark. Again, spreading the leaves out by hand can assure even layering. This step stops the oxidizing/fermenting. Here it’s a trade off between the efficiency of machine firing where larger quantities of leaves can be fired at the same time and the better control over the process by hand pan firing. Quantity vs quality — an age-old dilemma. A further benefit to the hand process is that it can better result in different shapes of the finished leaves. Dong Ding Oolong has leaves rolled in particular shapes resembling ore nuggets, while Silver Needle has its leaves rolled into needle shapes (thus the name). Such results require attention by skilled workers. Hand or machine here is determined by the flavoring used. For example, teas like Jasmines are flavored with flower petals layered between racks of tea leaves, definitely a task best done by hand, whereas teas flavored by oils can be done in the processing machine. Well, there you have it, and now you know why we carry handmade teas to give you that tea advantage. This entry was posted in Tea Info for Newbies and Up and tagged chinese tea, premium, quality, tea, tea processing. Bookmark the permalink.